You are here: Home / Break Even / What Is Your Break Even? The problem today is that most small business owners have no idea what to aim for each month in terms of “unit” sales. They find themselves getting so involved in the daily staff issues, checking supplier invoices to stock received and ringing up the till to the Joe Blog customers of the world. They don’t know how many “widgets” they need to sell to make a profit, and even worse how many “widgets” are needed to be sold to simply pay their fixed costs… like their rent. They base decisions which increase and decrease costs based on “feelings” more than real numbers. One of the hardest decisions small business face is the “Cost vs. Benefit” decision. Are these some of the questions you keep asking? This question can actually be easily solved by means of a really simple calculation called: The Breakeven Point calculation. The power in this “number crunch” is not just in the number, but more importantly the understanding of how it affects your business. The mark-up is the average profit achieved after paying any direct costs for those products. Sales valueless : Raw materials, freight cost, direct sales commissions and the like = Gross profit. When this is calculated as a % in proportion to the sales value, it stands to reason that the higher this %, the easier it is going to be to cover costs. It also stands to reason that the more units you sell, the $ value profit per unit is going to add up allot quicker and therefore allow you to be able to pay for the big ticket costs like rent, fixed advertising cost, permanent wage cost etc – including your salary. These “big ticket costs” which do not change as our sales increase and decrease are called Fixed costs. Your rent does not change if you sell 10 000 units in a month or just 1 unit. Your staff still expects their wage packet at the end of each week / month, no matter how many “feet” walk through the door. The costs that do change as sales increase and decrease are the raw material costs, freight charge paid per unit, sales commissions or any related “per unit” charge. These are called Variable costs. The higher the variable costs are, the smaller the Gross profit. And the smaller the Gross profit, the more units you need to sell to pay your Fixed costs. The same applies as your Sales value increases and decreases. If your sales price does not increase proportionately as your Variable costs increase, your Gross profit % will be lower. And once again, you will need to sell more units to cover your fixed costs. This is a trap most small business owners fall into far too easily. 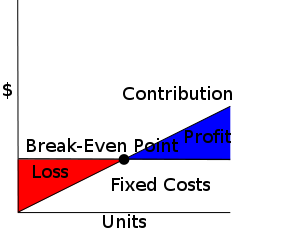 The (Variable cost) supplier (ie Raw Material supplier) increases their costs marginally over time, and if you the business owner is not keeping your finger on the Gross Profit pulse, before you know it, your Gross profit % is lower and it seems to be getting more and more difficult make a profit or just pay the bills, like the rent. Do you feel your business may be falling into this trap? Do you need to take more notice of how much Gross profit you make on your products? Are most of your fixed costs pretty constant, but you feel it’s getting more and more difficult to make those payments? Keeping in touch with this GP% (Gross Profit %) and your Fixed costs are not as difficult as you think. A simple review of your Breakeven point on a regular basis can be the driving factor to you making informed decisions about your business and how much is actually costs to keep it running. Take a look at out Do it yourself tab for an easy to follow template to help you calculate your Breakeven Point. What is even more powerful than just a simple Breakeven calculation is adding your set target Profit $ value as a Fixed cost (We call this Breakeven + profit). By therefore increasing your Fixed cost by your profit, you are now able to set a number of unit sales target per month. By breaking that down to a daily unit sales target, you are now able to keep your sales team “on track” with performance incentives that actually drive profit! Does your sales team desperately need a Breakeven+ profit target? Are you running a business to make a profit, or are you happy just plodding along not really knowing what challenges are around the next corner, and if your business is going to survive? Sweet post! Love to see more coming from you, I’ve read your stuff somewhere before.